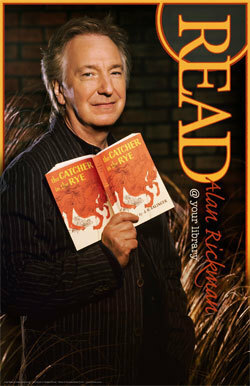 Read poster Alan Rickman. A poster that was made kwa the American maktaba Association to encourage reading! If wewe are lucky enough to live in the US wewe can order it here:. Wallpaper and background images in the Alan Rickman club tagged: alan rickman read poster ala american library association alan rickman. This Alan Rickman photo contains gazeti, karatasi, magazine, tabloid, rag, jarida, tabloidi, limemalizwa, anime, comic kitabu, manga, cartoon, and mkono. There might also be ishara, bango, maandishi, ubao, matini, ubao wa chokaa, newsstand, duka la magazeti, and kusoma chumba. Psshhh. I would read every day if I had this!